Madhuri Dixit is a diva par excellence and oozes class and panache with her looks. Madhuri Dixit is still in perfect shape and always has a smile on her face. The marvelous diva was the undisputed No 1 actress in the 1990s according to many and had impeccable screen presence. 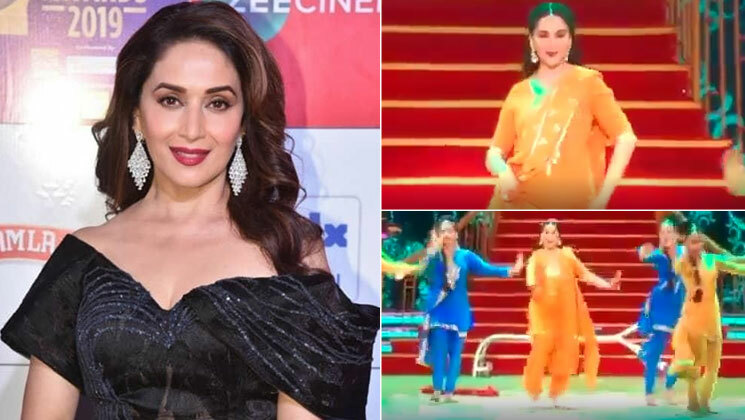 Now, Madhuri was present at Zee Cine Awards 2019. During the show, Madhuri Dixit took the audience by storm with her performance on ‘Hum Aapke Hain Koun’ song ‘Maye Ni Maye’. The diva was seen celebrating 25 years of her iconic film ‘Hum Aapke Hain Koun’, which is now considered a cult classic, by performing on the song ‘Maye Ni Maye’, which has been crooned by Lata Mangeshkar. The actress was at her marvelous best and once again proved that ‘class is class’. Madhuri Dixit is also awaiting her next release ‘Kalank’ and is the first song ‘Ghar More Pardesiya’ is a pure delight. Alia and Madhuri have totally mesmerised audiences with their moves. This beautiful melody is sung by shreya ghoshal and Vaishali Mhade. The lyrics of ‘Ghar More Pardesiya’ are by Amitabh Bhattacharya and the music is by Pritam.